Up until last week I had never been to Eastern Europe. I feel like I've travelled quite extensively over the last 5 years and yet realised I'd never made the journey East. I've also got another little secret. Until this year, I'd never been to a Christmas Market before! I know, I know! It sounds quite crazy. But all that changed when I went to Budapest for the first time. I feel like Budapest has grown in popularity in recent years. I've known quite a few friends to go. and rave about it. The mixture of history, architecture and nightlife draw people to it, but to me it has always been a Christmas destination. Somewhere that loves the spirit of Christmas and puts on a great show. 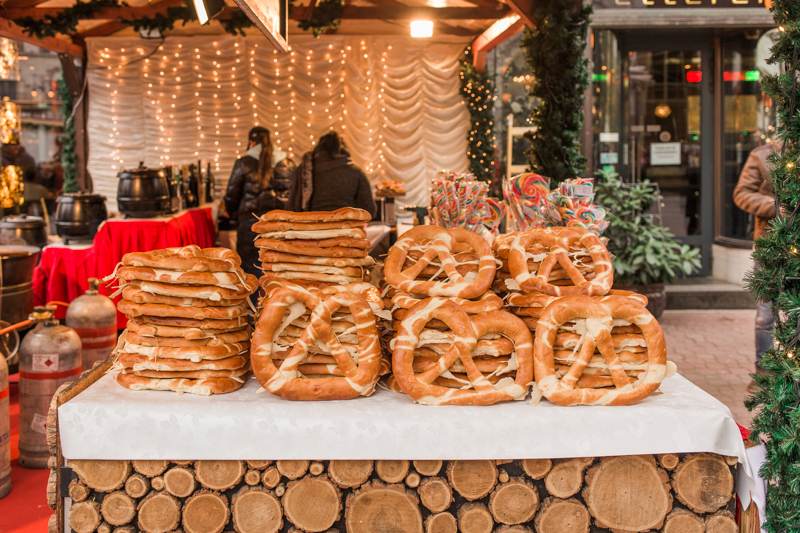 I think it's fair to say if you think of Christmas Markets, you probably think of Budapest. But what else can you do in the city over the Christmas period, and where is the best place to stay, where to eat and all those other niggly bits of information. 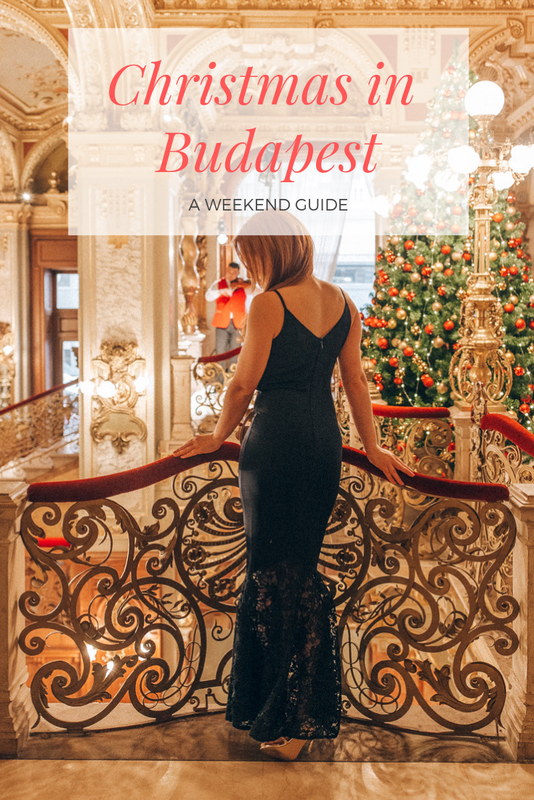 So without further ado, here's my weekend guide to Christmas time in Budapest. Of course if you are visiting in December you really have to go to the markets. 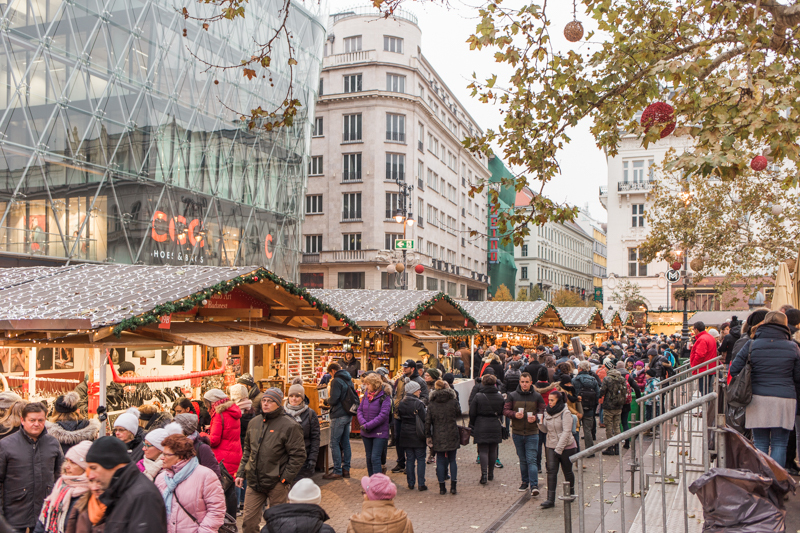 There are two Christmas markets on, although there are a number of smaller sections of stalls dotted about the city too. Theres the Christmas Market on Vorosmarty Sq and the Christmas Fair at Basilica. 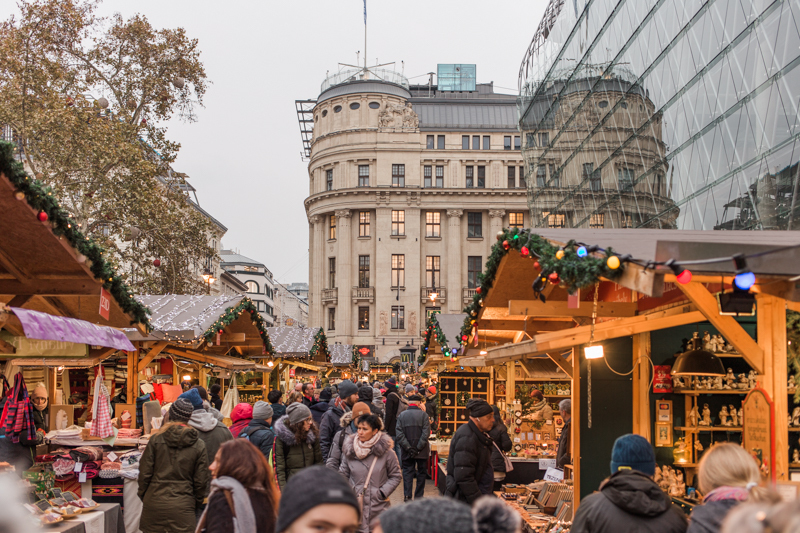 Having since visited Budapest, I've also been to a few Gottenburg Christmas markets, I'd say to expect more of the tourist type market stands than say local produce, but in some ways that could be seen as better as you'll truly get a Christmas feel! 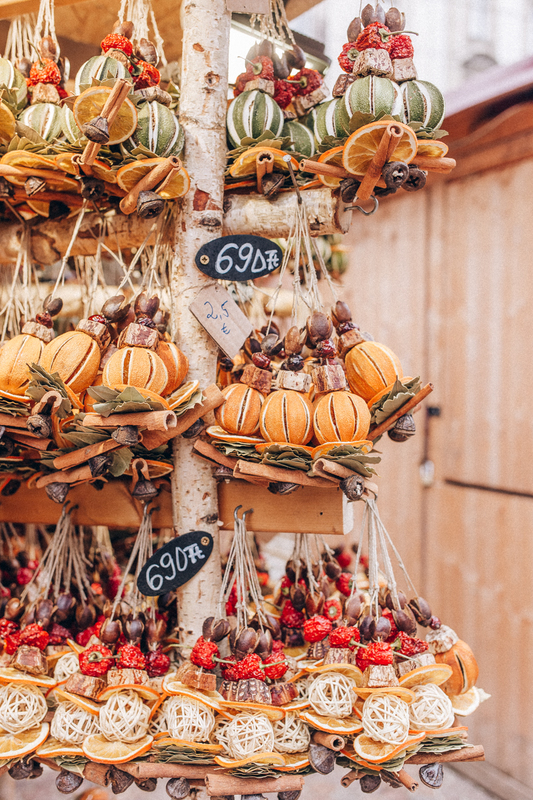 They sell everything from wooden toys, prints, hats and scarfs to mulled wine and cheeses. The huts are of course decked out in full Christmas force and the trees are up and there's music blaring out to keep everyone in the mood. They are of course busy so my advice is to always try and get there as early as possible. Also it might be worth noting, on a Sunday night the market closes at 10pm as I discovered, hoping to have some late night mulled wine! This of course isn't strictly a Christmas thing to do in Budapest but it feels sort of festive, and with the addition of mulled wine, it really is a Christmas winner. 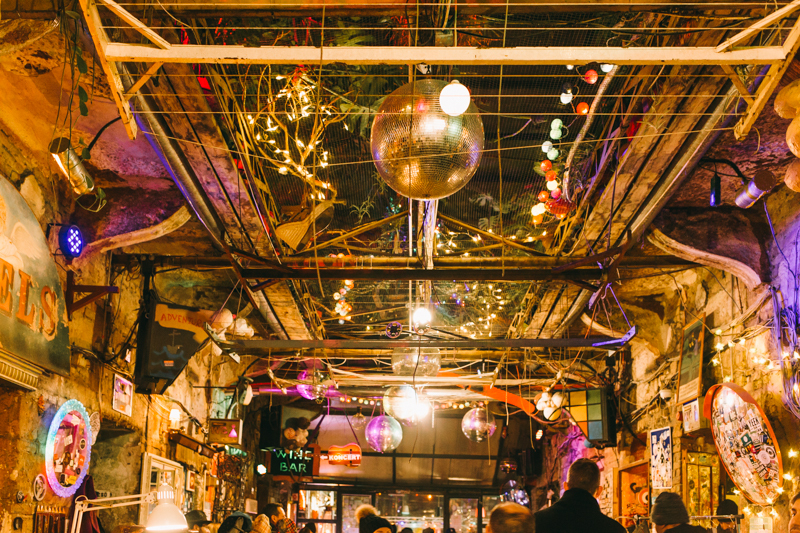 Ruin bars are the thing in Budapest They are all the rage and not to be missed. Szimpla Kert is the most famous one and I believe the founding farther of the ruin bar trend, but essentially they are bars built into the ruins of abandoned buildings. It's sort of an underground bar scene but to be honest is widely popular and not really a hidden trend. 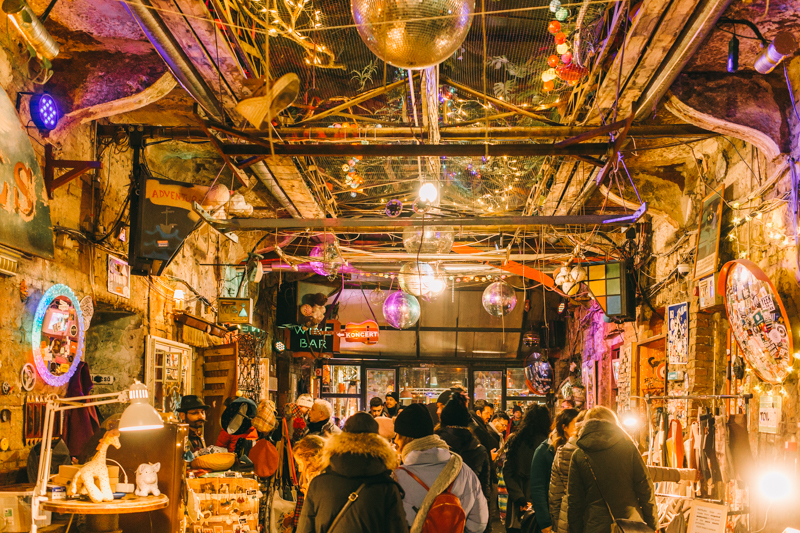 Szimpla Kert can only be described as just a bit bonkers. Theres market stalls during the day selling haberdashery, with assortment of random, abandoned items adorning the walls and ceiling. Mixed in around this are bars and alcoves for drinking. Grab yourself a mulled wine and just go with the flow. Whilst of course open all year round, I think going in winter time is actually nicer. First of all what you don't get in summer is those insane steam clouds forming. It really is a sight to behold with an almost magical quality to it. Also going from zero degrees to 38 degrees really is just pure bliss! I honestly don't think the experience would be the same in the summer. I'd recommend getting there early so its quiet. I got there at 7:45am and there was only a handful of people instead of the heaving crowds by lunch time. 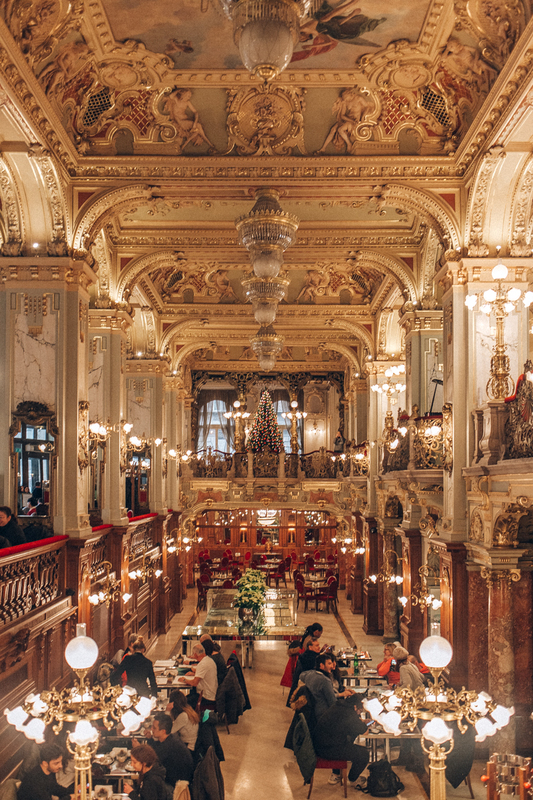 The New York Cafe is one of Budapest's most grandest buildings. 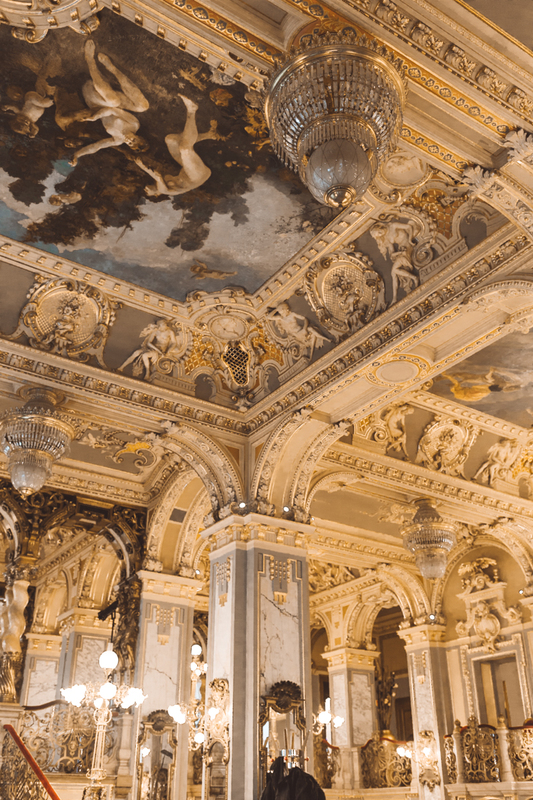 Dating back to the 1800s, in times gone by it was the centre for Hungarian literacy and poets to meet, drink coffee and discuss work. Now it s cafe which is a must see on any visit to Budapest. Yes it is a tourist trap, but I still think it's something you can't miss. 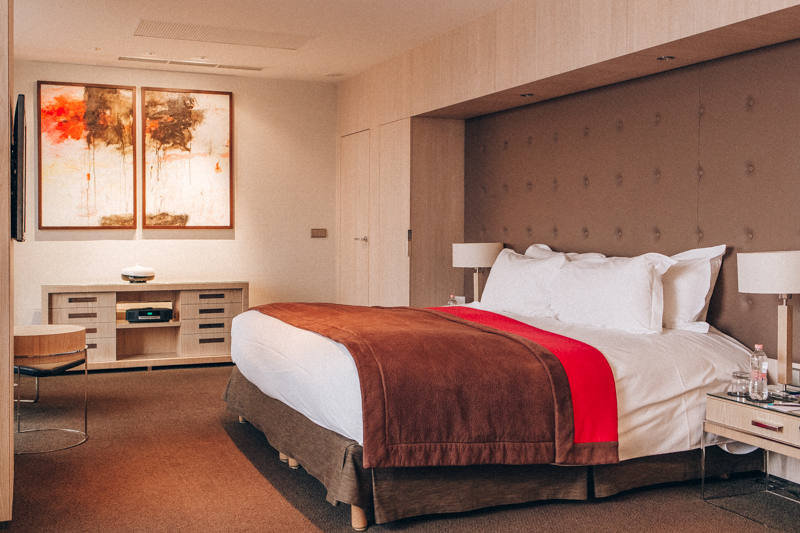 However you must book online! The queue for those who hadn't booked was insane. I don't think the food is worth the higher price tag, but for a coffee, cake and a nice look round its worth an hours visit. 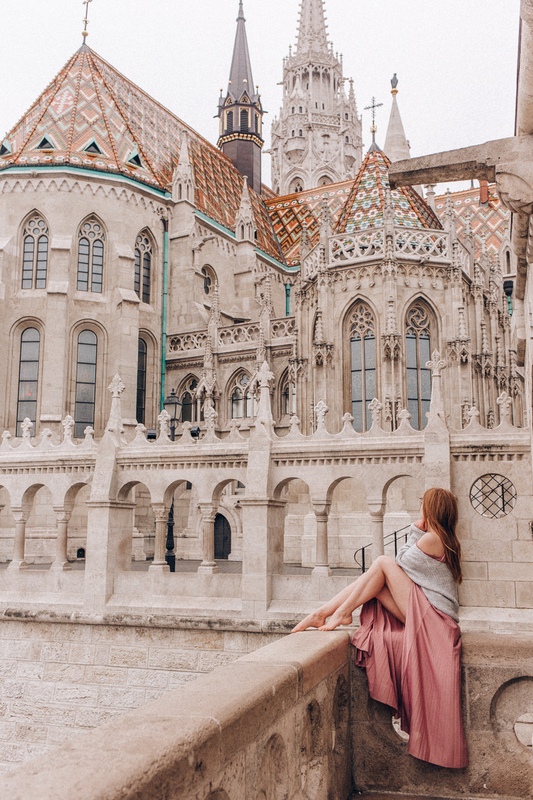 Fishermans Bastion can only be described as a fairytale castle. It truly is a stunning piece of architecture. Built between 1895 and 1902 it has always been a viewing platform and was designed purely for ascetic reasons and so whilst it looks like a castle, it has never served as one. 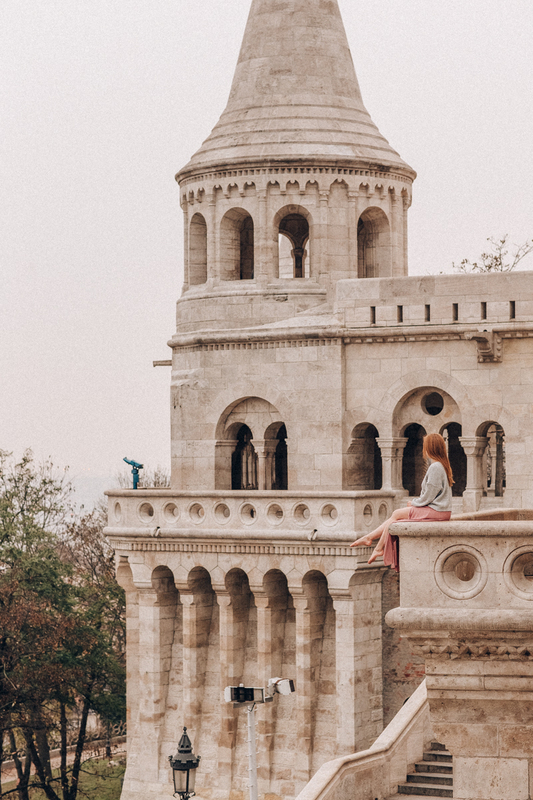 Situated on the Buda side of the river, its well worth the visit. Although, and without sounding like a broken record... get there early! 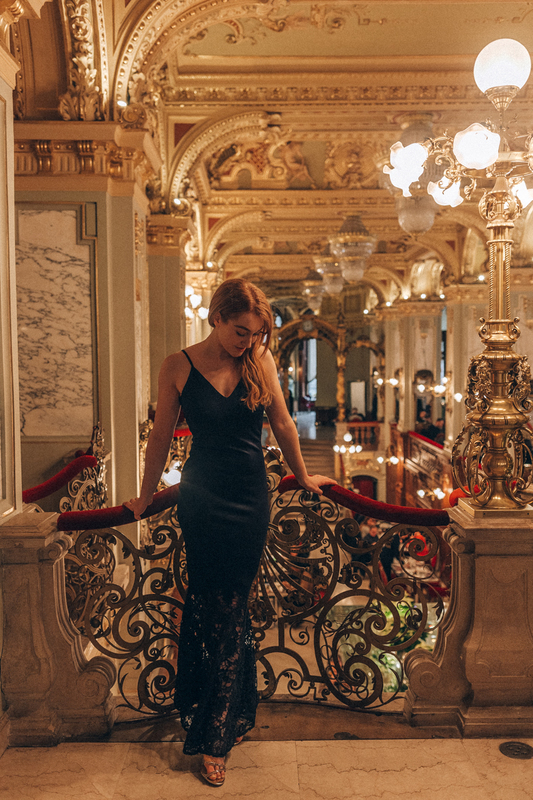 I stayed at the Sofitel Budapest which I have to say is perfectly located for everything in Budapest. It is right opposite Chain Bridge on the Pest side making it pretty much central for getting to all the key locations. At a tourists pace it took me around 20 minutes to walk to most places like Parliament and St Stephens Basilica. 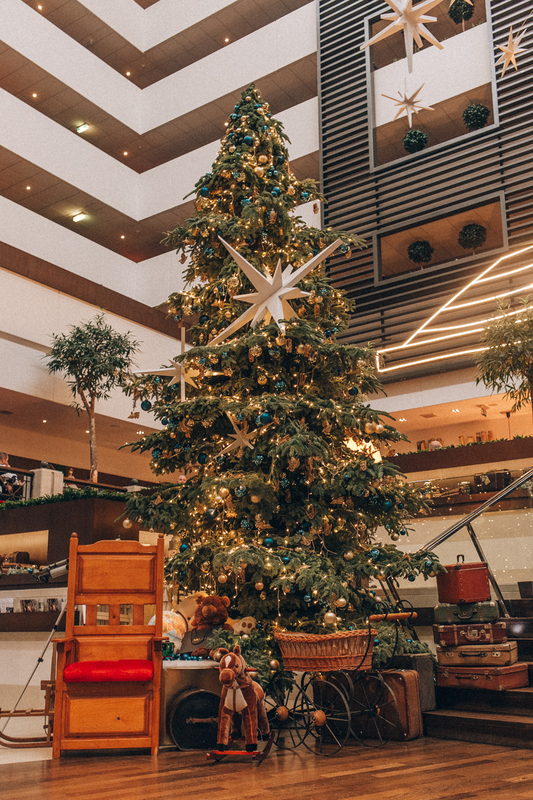 The hotel has a great, lively feel as soon as you step in, and they really do go all out for Christmas, making it a great hotel to get you into the Christmas mood. They also have a daily visit from Santa too which is great if you have kids. 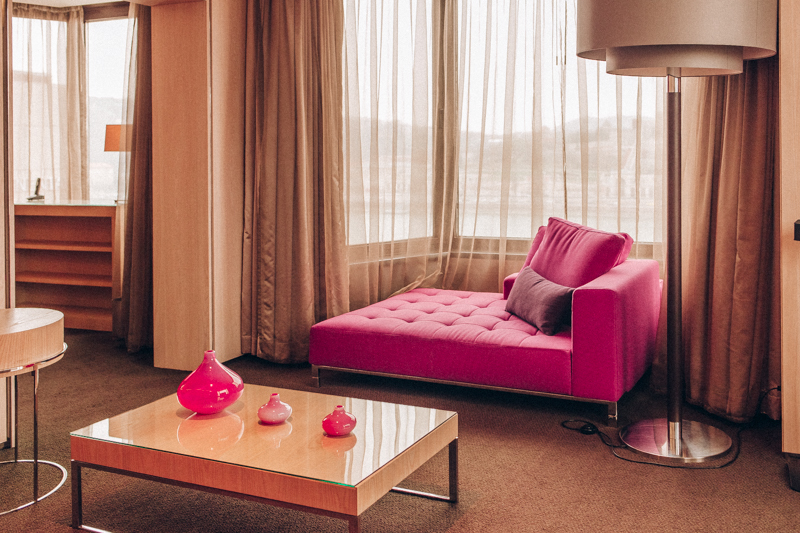 I'd say the design of the hotel is more business casual but with some more funky twists such as pink colouring in the rooms. My room, 820, was humongous, making it a great base to come back to when exploring the city. As you can see it also had amazing views of Chain Bridge from the lounge and the bathroom! 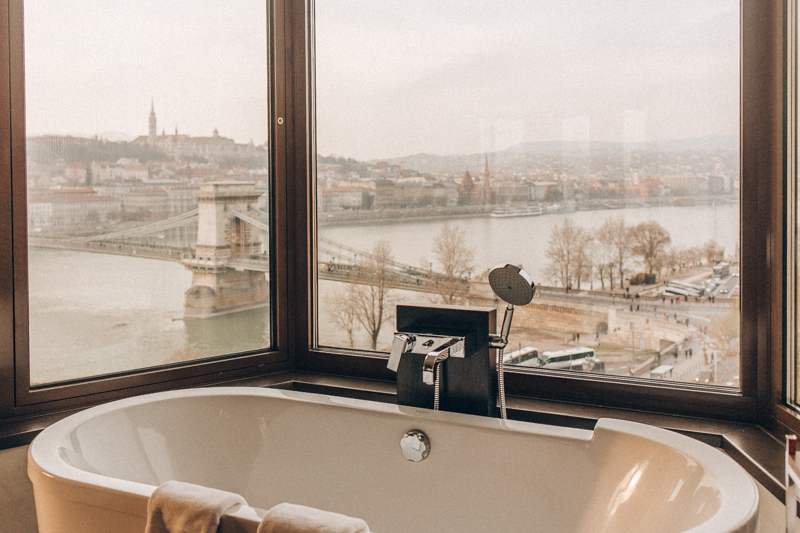 Imagine- Sitting in that bath, glass of wine in hand, with chain bridge lit up; it's quite blissful! Budapest isn't a huge city and you can certainly walk around by foot. But I'd say for a lot of the tourist hot spots, its a good 20 -25 minutes between them all. Which isn't that long, but when the temperatures are literally freezing, sometimes it's just easier to hop in a car. Now Uber is actually banned in Hungary so I used a similar app based Taxi service that was allowed called Taxify. It's legit and worked exactly the same way as Uber. Taxi's are pretty good value, and off the top of my head I remember an 11 minute journey was the equivalent of £11. So there we have it. 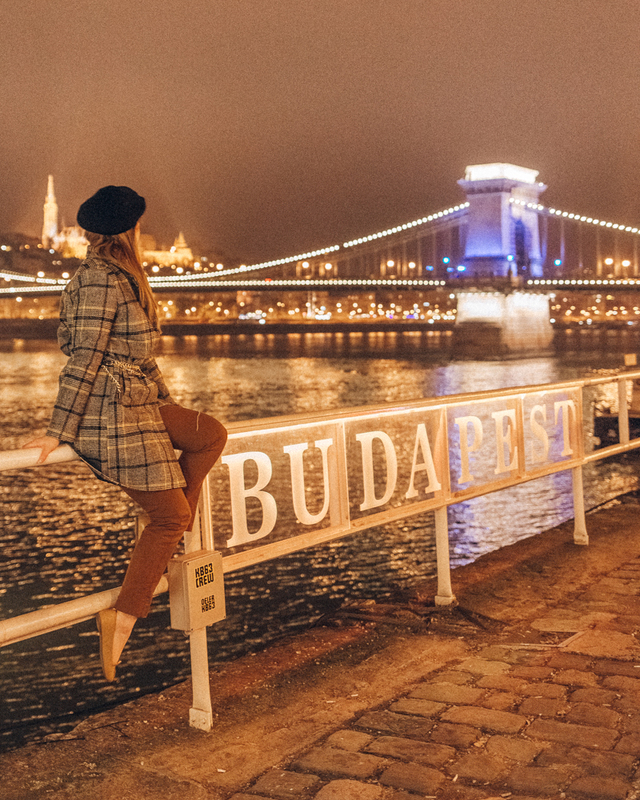 A weekend guide to Budapest at Christmas time. If you liked this guide, why not pin it for later on Pinterest. It's such a beautiful city! I'd love to visit Budapest, it's top on my list for next year!